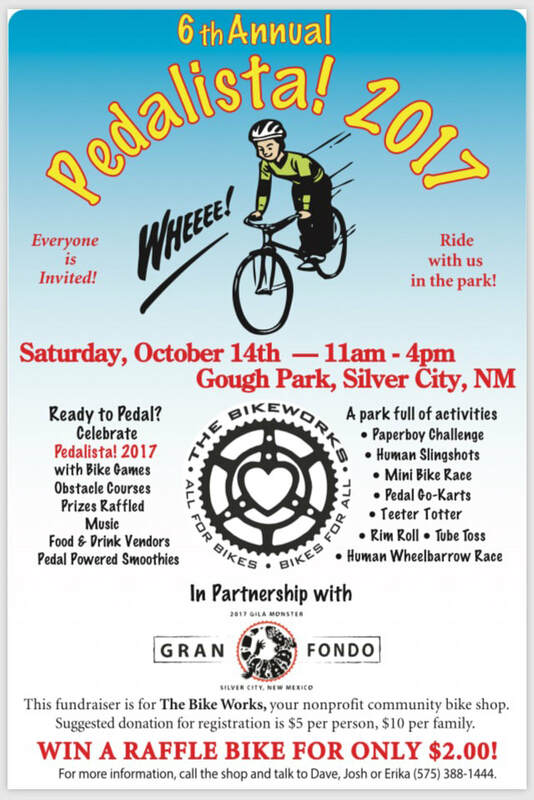 The Bike Works, Silver City’s nonprofit community bike shop, is back with the 6th annual Pedalista!, a family fun event that focuses on the fun and joy of bicycling. On Saturday, October 14th from 11am-4pm, Gough Park will be full of all-ages games and activities utilizing bike parts. This fundraiser supports the year-round programs of The Bike Works. A raffle ticket for a chance to win a bike is included with admission. The event also marks The Bike Works’ 10 year anniversary of operating the community bicycle workshop in the Recreation Center Annex on 10th St.
Activities and games include the mini-bike race, the paperboy challenge, the rim roll, the human slingshot, a scavenger hunt, the teeter totter, human wheelbarrows, pedal go-karts, plus much more. Our goal for this event is simply to have a great time in the park, celebrating the bicycle and all it offers us; physically, socially, financially, and environmentally. We wanted to add to the energy generated by The Tour of the Gila Gran Fondo, but bring out a whole different aspect of bike riding. The Bike Works is a community supported 501(c)(3) nonprofit organization that works to make bicycles accessible to everyone. Operating a community bicycle workshop, The Bike Works staff teaches bike mechanics through a hands-on learning experience while bringing donated bicycles back to life. Programs include the Earn-A-Bike Program, Weekly Guided Bike Rides, the DIY Repair Workshop, Affordable Quality Reconditioned Bikes for Sale, and a new Recycled Bike Art & Utility Program. Programs are on a sliding scale donation basis and open to the public. Donations are necessary to keep us rolling! Additional information is available by calling our shop at (575)388-1444(575)388-1444. Copyright © 2012-2017 The Bikeworks. All rights reserved.